Sunken ship aquarium decorations are the popular fish tank decorations for shipwreck theme that a lot of hobbyists love to use. 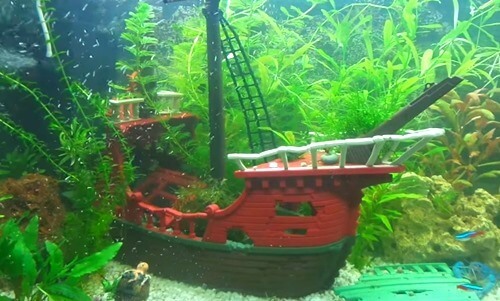 Shipwrecks are a natural underwater scene and makes a perfect theme for any aquarium. The fish look just natural swimming among them. 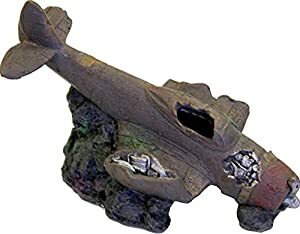 There are basically two types of shipwreck fish tank decorations. One is a complete ship and the other is a ship in two pieces. 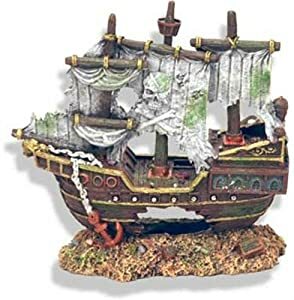 Here are some of the best shipwreck ornaments for your fish tank, click on the images to go to the sale pages where you can buy the items. 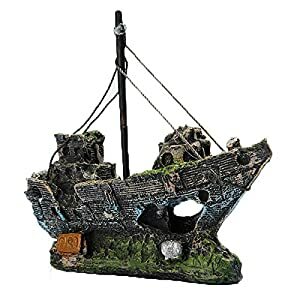 The shipwreck aquarium decor that is a complete ship is best used for a medium or small aquarium. 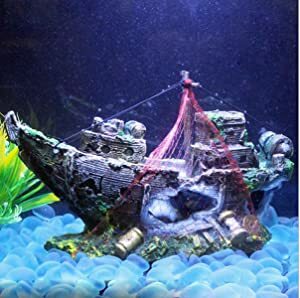 In most cases, the holes in the ship are too small for the fish to swim in but they look great just swimming around it. 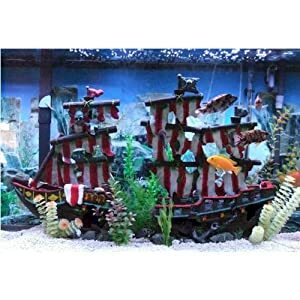 The decor that is made up of a ship in two pieces is best used for a large aquarium. For a good effect, you need to space them a little. Don’t align them in a straight position, place one of the half in a slant for a more natural look. 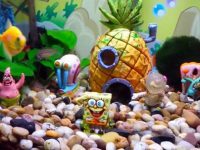 These days you can get fish tank decorations for just about any scene. Recently I stumbled across some really cool ones. Rather than a sunken ship, have you considered a sunken airplane instead? 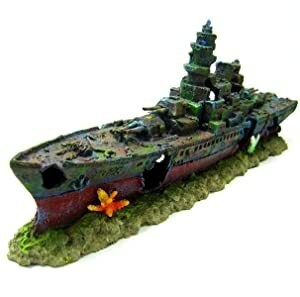 What about a sunken battleship or even a sunken submarine? 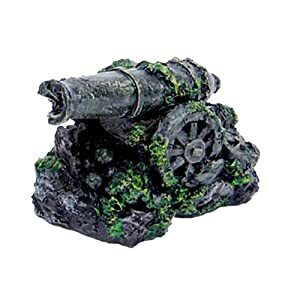 These make an excellent alternative to the traditional sunken galleon ship fish tank decor. When choosing a shipwreck fish tank decor, always pay attention to the size of the holes in them. Almost all shipwreck aquarium decor have holes which would allow fish to swim in and hide when they want to. Make sure that the holes are large enough for any of your fish. If the hole is too small, the fish might be able to get in but might not bet able to get out. The beauty of shipwreck aquarium decorations are how detailed some of them are. Every crack, hole and rotting wood is carved exquisitely into the design of the ornament. 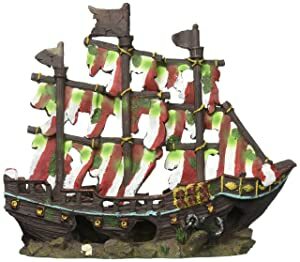 The larger ornaments even have cannons, ropes and cabin doors carved into the design. 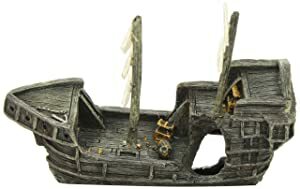 What you want to do with the shipwreck theme is to create a scene that looks as if the sunken ships have been underwater for a very long time. 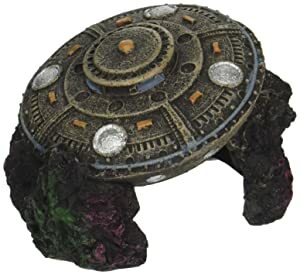 You can get this effect by positioning your rock around the ship. Don’t use too many rocks or it will take the focus away from the ship. 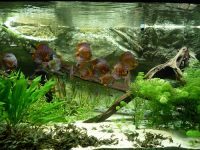 Placing aquatic plants will also compliment the effect. Plants like Moneywort and Amazon Swords would be ideal plants that you could use. 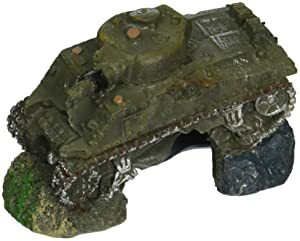 If your tank uses an aquarium air pump, you could place the air tubes so that the bubbles come out of one of the holes in the ship. 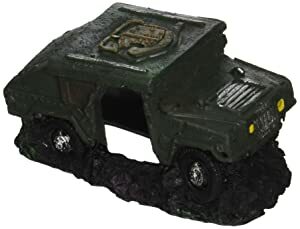 This makes a really nice effect. 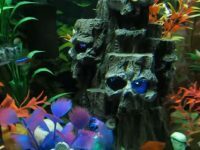 Sunken ships in the shipwreck theme have long been the traditional fish decor for aquarium themes. 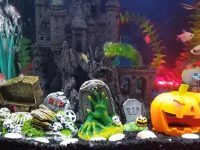 These fish tank decorations have stood the test of time and still make awesome decorations for your aquarium.